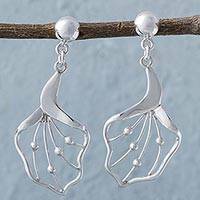 Superbly crafted of sterling silver, this design evokes the lush Thai rain forest. 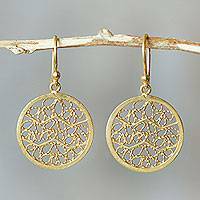 Aoy presents earrings of lacy symmetry. Inspired by the religious stupas at Bali, Rupadana designs a pair of cone-shaped dangle earrings. 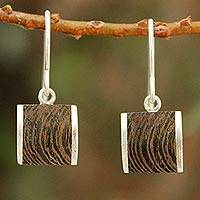 Each earring features a spire of sterling silver that hosts a dark lava stone. Size: 3.3" H x 0.5" Diam. Size: 2.4" H x 0.4" Diam.